Karen first started drawing by reproducing images from Edward Curtis’ photography from the late 1800’s. She taught herself technique by looking into the past and bringing out her voice using a realistic approach to portraiture. Currently Karen (who is a member of the Choctaw Nation of Oklahoma) has been working on a portrait series entitled “A Choctaw Story of Land and Blood”. This ethnographic series will use her own family records of birth, land allotment and marriage documents to illustrate the history of the Choctaw in 1800 Indian Territory. This 20 piece series is scheduled to exhibit at the Coconino Center for the Arts in Flagstaff in the near future. At the same time, Karen is also working on illustrating the Choctaw creation story “Nanih Waiya” for the Museum of Mississippi History’s permanent display. 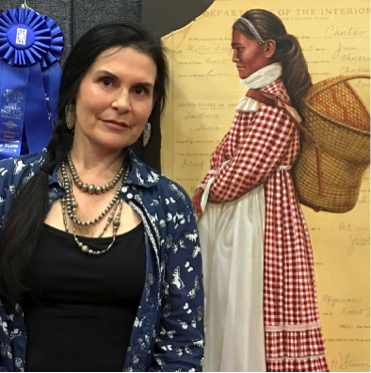 Her work is included in the Choctaw Museum collection where she has won many awards from the Choctaw Nation including twice for Best of Show as well as People’s Choice.